Almost anything and everything will be of interest to guests. One of my first comments to guest in the boat is that if your want to stop, slow down or go in any direction for a photograph please let me know. We do not run on a tight schedule about the only guideline is to be back to the lodge for dinner as a result there are always interesting photos. Some guests have an interest in birds and some in the variety of scenery some even lake pictures of the bears. 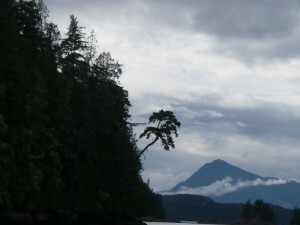 August whale watching can have some interesting mornings as the warm days will produce fog for the following morning. The fog may be patchy and is gone by noon but it does not prevent us from leaving the dock as we have radar and GPS. 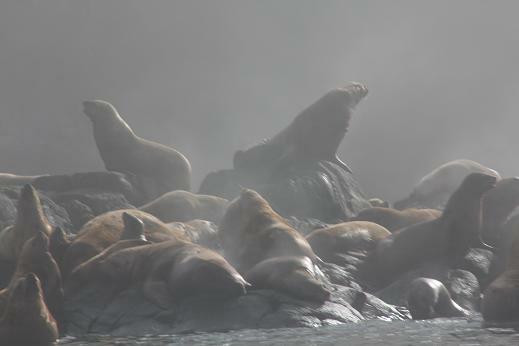 The fog does produce some unique photos such as this one with stellar sea lions on the rocks near Vancouver Island’s Telegraph Cove. The sea lions are now in the area most of the summer whereas in past years they were only passing through in June and September on their migration between California and Alaska.